The Holiday Inn is adjacent to the Rushmore Plaza Civic Center. As soon as you enter our greenery-filled atrium, featuring a 60-foot waterfall, you know you're in for a memorable trip. The Holiday Inn Rapid City-Rushmore Plaza hotel offers more than beautiful accommodations, though. Friendly service, well-equipped rooms and excellent amenities make us the preferred hotel choice for Rapid City travelers. When it's time to work, you have everything you need with our Business Center, free high-speed, wireless Internet access and well-equipped executive rooms. Take advantage of all our great amenities: indoor pool, sauna, whirlpool, Fitness Center and a sun deck. When it's time to dine, find your favorite dish or enjoy a drink at our restaurant the Gold Bison Grill. Availability: Only a few rooms left! The night of the 11th is SOLD OUT. Reservations: Click HERE for a direct reservation link for the WASHTO group. You can also use the Online Booking Code: WAS or call the hotel at 605-348-4000 or 844-516-6415 and mention the WASHTO group rate. Parking: Parking at the hotel is $5 per night. Welcome to the historic Hotel Alex Johnson. Located in downtown Rapid City, the hotel is the newest member of the coveted Curio Collection by Hilton. Since opening its doors on July 1, 1928, the hotel has played host to several presidents, countless celebrities and a few spirits of its own. The handcrafted décor will leave you feeling that every step you take is a step back in time, while the amenities and services immerse you with modern comfort and luxury. You’ll revel in the stunning and mysterious allure of the Hotel Alex Johnson. Availability: Sold out June 9th - 11th . Three rooms available on the 12th and 15 on the 13th. Reservations: Click HERE for a direct reservation link for the WASHTO group. You may also call (605) 342-1210 and mention the group code WASHTO. A commitment to nature by being eco-friendly and sustainable. Much care was given to incorporate the beauty of the natural surroundings of the area into the hotel. Our guests will discover the grandeur of the area and this property. Mount Rushmore is recreated with 75 different natural stones within a 60 foot Medallion in the lobby. The rooms have 34 different themed poster of the area depicting the beauty of Mt.Rushmore, Sylvan Lake, Custer State Park and the Black Hills. A commitment to excellence and good value by being functional and artistic. The rooms carry an international touch with the vibrant design and color of upscale Urban hotels. We invite you to experience our hotel and award winning guest service. The Howard Johnson Inn & Suites is conveniently located within walking distance to local downtown Rapid City shopping, dining and entertainment, and is within a short driving distance to many national attractions including Mount Rushmore and Crazy Horse Memorial. Reservations: Call 605-737-4656 and mention the group rate for Western Association of State Highway and Transportation Officials. 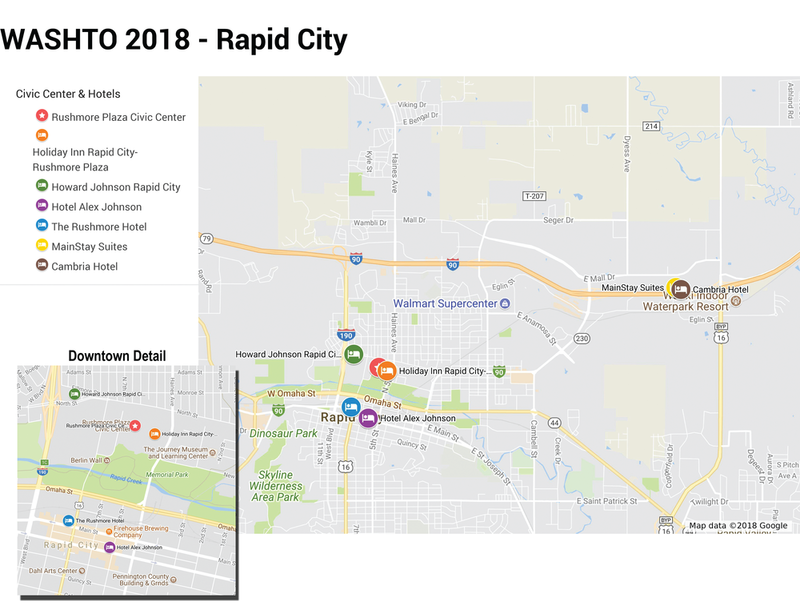 Scheduled shuttle service to/from the Rushmore Plaza Civic Center will be provided for the Cambria and MainStay Suites. Our well-appointed suites feature spa-like bathrooms with Bath & Body Works bath products. Microwaves, two flat-screen TVs, sofa sleepers, coffee makers and hair dryers are also provided. Select suites come with wet bars. We invite you to experience the Cambria hotel & suites. At our Rapid City hotel, we want you to have a great stay, every time you stay. At MainStay Suites Rapid City, we want visitors to see South Dakota like we do – iconic monuments, the majestic Black Hills breathtaking national parks and a thriving shopping and dining scene. Visitors will find all the comforts of home in our brand new, apartment-style suites. Our spacious accommodations feature full kitchens, modern cooking appliances, flat-screen cable TVs, room service and large cozy beds. Complimentary high-speed Wi-Fi and spacious work desks also make it easy to stay connected and productive while away from home. The upscale amenities and services at MainStay Suites Rapid City are an unbeatable value in western South Dakota. Grill out with the family or roast s’mores in our tranquil outdoor courtyard. Keep up with your workout routine in the hotel fitness center. Cool off with a dip in our sparkling indoor pool. From complimentary buffet breakfasts to free shuttle service (airport and citywide, contact in advance for pick-up), our friendly staff always goes the extra mile to make guests feel at home.